Streaming audio video hosting, mp3 streaming, live radio streaming, cyber-logics. Experience these live stations to get a better understanding of what your radio station can do. Your listeners depend on your audio broadcast being there. And there's no better way to be there all the time for your Internet audience as well than by streaming your audio broadcast over the Internet. The world is listening. And your broadcast should be what they hear. By streaming your broadcast you expand your audience exponentially! You're no longer limited by the strength of your radio signal. Your only limitation is the reach of the Internet. And that's a lot of listeners. Barix Instreamer hardware encoder (see below) that converts analog and digital audio into MP3 which then can be transmitted to our streaming server. The Barix Instreamer is an intelligent hardware encoder that converts analog and digital audio into MP3 which then can be transmitted to our streaming server. Ideal for live broadcasters, this device eliminates the need to dedicate a computer solely to streaming. The Instreamer can go from box to streaming in 10 minutes and is configurable through a local or remote web interface. 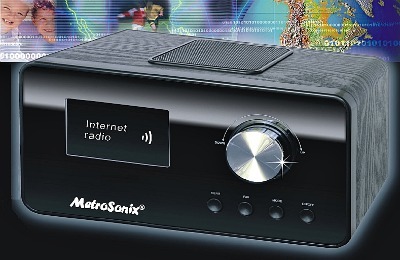 Connection to audio equipment is made simple by offering stereo RCA analog as well as S/PDIF and coax digital inputs. The fidelity of the audio signal at similar bit and sample rate is superior to what can be found with free or low-cost software based mp3 encoders. Up to eight Shoutcast or Icecast streaming servers can be sent an audio signal at once. This device works on both a static and dynamic internet connections. Supported bit rates: 32kbps - 192kbps. Supported sample rate: 16kHz - 48kHz. Channels: mono and stereo. The Instreamer is a hassle-free encoder. It is a small, durable, low-power device that is not suspect to viruses, worms, or crashes that can plague encoding computers. Hardware: The cost for the Barix Instreamer encoder which includes configuration to our streaming server and shipping of the device to you is $450. Live Streaming: is billed based on total monthly maximum concurrent users and selected bitrate. For example, if you have a server that can support 100 users per month at 128kbps, you would pay $160 per month. If you are a radio station broadcasting your live audio feed on the Internet, Now your listeners can have the freedom of listening to your audio broadcast around their home or office with a standard Wi-Fi or wired Internet connection, No computer is required. Now you can reach your listeners Worldwide with this Wi-Fi Radio!!! !